Cheesy. I know. 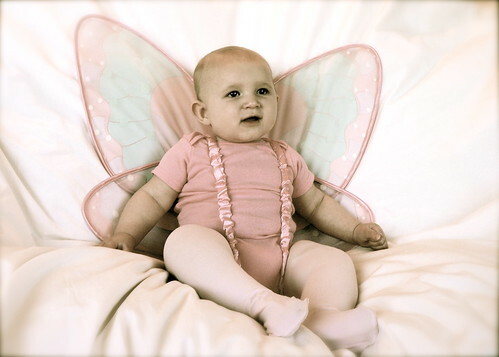 We had to spend $10 more at Gymboree to get a $25 coupon, so I grabbed some wings. I faded and antiqued the color and blurred the edges in iPhoto to achieve the effect. By the way, this wasn't professional taken. I threw our white down comforter over the couch, sat Dagny up, took a bunch of pictures, and picked out the best ones. I used a Lumix DMC-FZ5 as recommended on Boing Boing a couple months back. I'm pretty happy with it, but I want higher resolution (it's only 5 MP) and more importantly a camera that can take pictures in lower, indoor lighting without blurring too much (I don't like how the flash washes things out). Who needs to pay a professional photographer $400 to take 2 rolls of film (and that doesn't even include the prints)? This way I own the copyright. Weeds Is on the iTMS!